Heath Reams was last seen on Sunday, July 27, 2003 in Jenninngs, Oklahoma. Reams had been staying with Amanda Bolstad and her boyfriend Todd Ross for severaldays when Reams was going through a divorce. On November 5, 2003, Reams' 1997 white Toyota Four Runner was located in a pasture three miles east of Jennings at the Ross residence. On August 14, 2015, Bolstad, aka Amanda Sue Sanders, plead guilty to manslaughter. 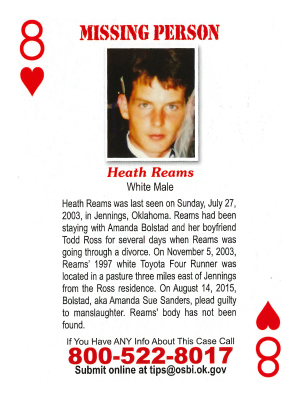 Reams' body has not been found.